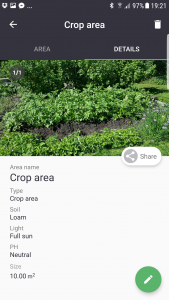 In MY AREAS you divide your garden, allotment or another type cultivation area into manageable pieces to make it easy to keep track of plants and workload. If you have a small or big garden doesn’t matter. A garden area can, for instance, be a flower bed, a crop area, a greenhouse or even a balcony or a flowerpot. It is up to you to create your different garden areas and name them as you wish. If you have several areas of the same type, you can separate them by adding a number for instance. You can add notes specific to that area, and you can fill in all kinds of details. Most importantly – You can also note what plants you have in a specific area. 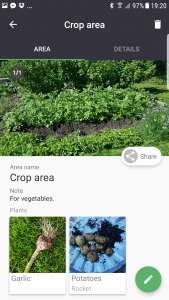 You edit and add information and photos by tapping the green pen in the right bottom corner. For each Area, we propose that you add one or several photos, that way you can follow the development and how the area looks at different times of the year. Click on the Tick mark in the upper right corner to save. 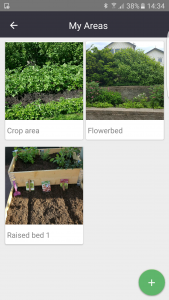 Enjoy adding all your AREAS to Gardenize and never forget again!